This side view shows the addition and link that preserve the historic character of the house from the street. The homes along lake of the isles parkway are beloved by Twin Citians for their grace, beauty, and historic interest. One such home, the Charles Frederick Keyes house, was built in 1904, before the lake it overlooks was even dredged. The eclectic home, designed by architect Adam Lansing Dorr, was among the few in the area that had remained largely untouched over the years. Now this designated Minneapolis historic landmark has moved into a new century, thanks to the attentions of its current owners and Rehkamp Larson Architects, working with Reuter Walton Construction. Gazing at its restored facade, complete with historically accurate front porch, the average lake-home gawker would never guess what modernist surprises are contained within. 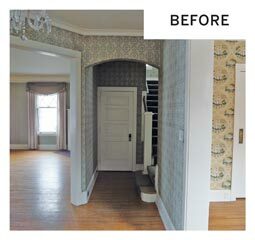 “The goal was to make it more livable for a modern family,” says co-designer Sarah Nymo, an associate with Rehkamp Larson. 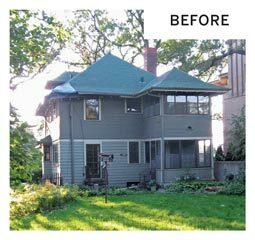 Quite petite by Lake of the Isles standards, the home’s footprint was just 910 square feet, with a large side yard to the south. Because of its historic designation, the house could not be altered in any way visible from the street. That meant the architects could not design an addition on the home’s south side. Another challenge: The homeowners wanted to add on an attached garage. 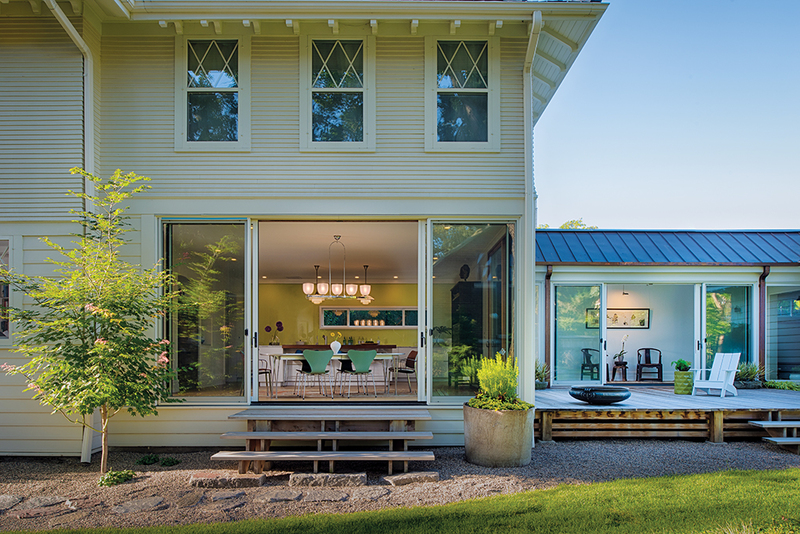 Rehkamp Larson’s solution was an elegant one: a 1,300-square-foot, two-story addition to the back of the home, with a narrow gallery linking the kitchen and garage. In fact, the project so successfully added to the historic building, it received a Minneapolis Heritage Preservation Commission award earlier this year in recognition of its design and architecture. 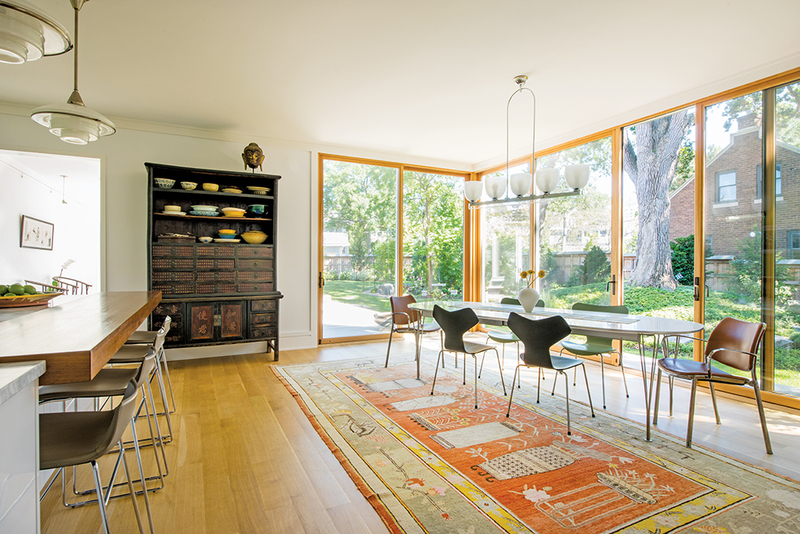 The kitchen overlooks a spacious sideyard, now transformed into a serene Asian-inspired garden. No upper cupboards block light in the kitchen. 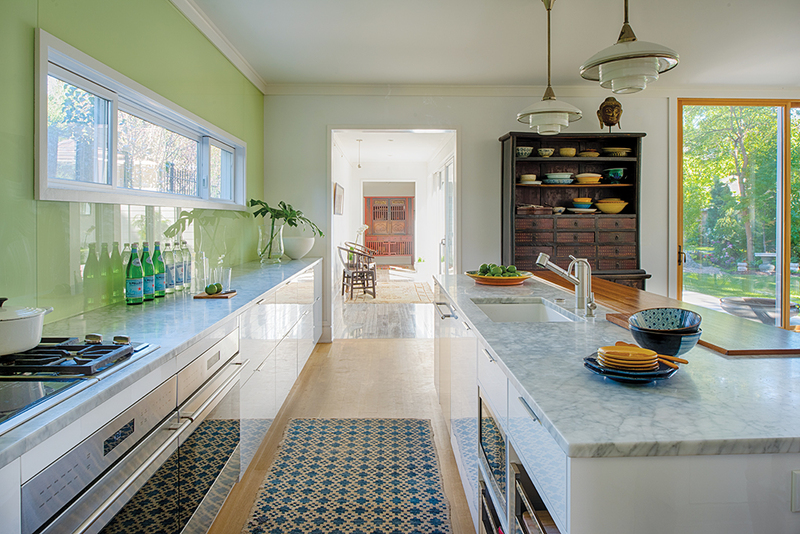 The kitchen itself has pleasingly clean lines, marble counters, and no upper cupboards blocking the light. A large Subzero refrigerator is neatly tucked into an adjacent butler’s pantry. The gallery connector also sports huge south-facing French doors, which lead to a bleached-cedar deck. At the back of the gallery are a small laundry and mudroom. Another Asian-inspired element are the pale wooden staircase screens, which are both functional and beautiful. The staircase itself moved to a more central location to give the first floor better traffic flow and sight lines. The new white oak staircase and its pale wooden screens are both functional and beautiful. Lynette Lamb is a longtime Minneapolis writer and a former managing editor of Minnesota Monthly and Utne Reader magazines. Lamb is also married to a former residential architect, meaning that she long ago grew accustomed to living without window treatments or overhead lights.